A good flow of people and not so packed it’s uncomfortable. Local rock shows are a great place to mingle with like minded people and pick up some choice possessions to add to (or start) a rock collection! October is the month for my local rock show. I have been a member of the club coming close to a decade now. Last year I stepped down from the role of Vice President of Special Events, a title I held for 6 years. It is always good to change things up and give someone else a chance to make a difference. 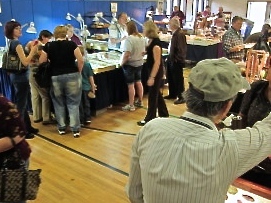 I am still very active in the goings on and will be volunteering for the up coming show, as I have done for past events. My parents told me we went as a family to the rock club’s show in it’s beginning days, which I have vague memories of. None of us were ever members and it wasn’t until my adult years I joined. Not sure if either of my parents thought I would turn into the crystal believer I am today? A big take away from the years involved with the club is a better understanding of nature. Some things us humans and nature (I’m looking at you mineral kingdom) have in common is noticing, being around to witness change. The ability to see life unfold, develop and then choosing to contribute or be passive with the states of maturity. I believe both life forces offer opportunities, the choice to either release energy or remain quiet. I have attended a few different shows around New England and still rank my club’s as one of the top 3. The mecca of all rock shows is held during the month of February in Arizona. Everyone tells me I have to go, “There is nothing like it, yards and yards, football fields upon football fields of rocks!” they say. To me rock shows are basically all the same. It’s a coming together, celebrating the majestic-ness found within the earth, under one roof. Some show’s house hundreds of dealers while others have a handful. The conclusion I have come to in regards to a show, size doesn’t matter. Square footage is not the issue, is not the success meter of a show. 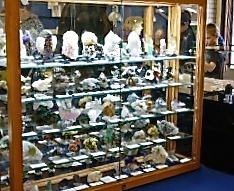 A good focus for a rock show with heart is who collects the minerals, how they are displayed, traveling conditions, health of the dealers, reasons for selling, location of venue, staff running the show… theses are the things that keep me coming back. Many shows have spectacular displays featuring larger scaled beauties. Sometimes the displays are to showcase a theme carried throughout the show. Other reasons simply need no other excuse but to show off the mineral and share the spender with which took years to create! I’m drawn to those who care about their goods quicker than those who don’t have the right things invested working with mother earth. I believe nature looks up to us, fingers always crossed we do better tomorrow. The rocks are her children, the oldest children with the most wisdom and assistance to give to others. People don’t have to buy into the metaphysical aspects of the crystals. Dealers should be respectful and honor the mineral helping with their livelihood. Buyers should be aware of what they are purchasing, especially marveling over the age of the specimen in hand. Love what you have and look forward to sharing with others to bring about more joy and knowledge. Give your local rock show a try. Stop by and visit the information booth about the club hosting the show, you never know what you might unearth!